BUNK HOUSE -This is a cozy, one-level heavy timber log cabin with tin roof, has one private bedroom with a king size bed and 1 & ½ baths. The living room has a bunk bed and a twin size bed. This is a children’s favorite since it is the closest cabin to the petting farm, the swing set, and because of it’s cowboy décor and bunk beds. A ramp entrance (making it wheelchair accessible) and the fact that it is all on one level (no steps) makes it a very easy for our physically challenged guests too. There is also a queen size sofa bed. This cabin has a wood-burning stove with glass doors and a hand-stacked stone firewall and mantle. Great for 2 adults with 2-5 children. •	Outdoor Hot Tub, Picnic Table, and Charcoal Grill on the private deck and rocking chairs on the front porch. •	Fireplace in all cabins and the first rack of firewood is provided (in season from October to March). •	Satellite Flatscreen TV with Blu-ray player. •	All linens, bedding, and towels provided. • Air-conditioned and heated for year round use. 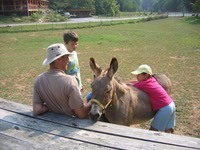 Additional adults are $12/night and children are $8/night for all cabins. All rates are before tax. All prices are subject to 14.75% sales and lodging tax.